Improving Warehouse Productivity And Efficiency With Controlled Floor Space. Experienced factory and warehouse managers know that increasing and maintaining warehouse organization, product efficiency, and quality is a top priority. The struggle for a better, more efficient system to produce a quality product, then to handle, store and ship that product requires strategic planning with long and short term goals. Improving your warehouse organization, productivity and efficiency starts with controlling your floor space. Smaller scale industries have a tendency to concentrate on modifying the product handling process to compensate for the lack of expandable warehouse or factory floor space. This is mainly due to the ever increasing cost of construction or the inability to expand their leased; property locked location. Many production plants and warehouses battle the constant problem of the lack of usable floor space and the high cost involved with industry growth. Pinpointing the problem areas that are inefficient are sometimes challenging, and the focus is placed on adjusting production for the lack of workspace instead of correcting the main issue. Although your facility floor space problems may vary from other industries, the answer to the problem is similar. How do I get the most efficient production and product storage with the space available to me? Is the use of your warehouse space wasteful or are you out of usable space to expand your facility operation? KABTech’s warehouse solutions have assisted thousands industries and businesses all over the country in solving these problems by utilizing wasted in plant space and maximize their productivity and efficiency. One of the easiest ways to increase usable floor space at very little cost is to go up, not out. Finding new ways to use your existing vertical wasted space for offices, product storage, product production and quality control is the most economical way to upgrade your facility. Here are a few ways to recapture square footage you are not using and put them to work for you. Mezzanines and 2nd Story Work Platforms. The simplest and most cost efficient way to create new floor space in your plant is to incorporate a freestanding or self supported mezzanine or work platform. One of the biggest advantages to adding a mezzanine to your production floor is that it will not affect the way you use the floor space below the mezzanine. Free span structural mezzanines can be built over existing office structures, machinery, production assembly lines or just about anything found in a warehouse or industrial plant. Mezzanine floor options including several different surfaces, from economic composite flooring to poured concrete. The uses of a mezzanine or raised work platform are endless, and it is the most cost-effective way to double your available square footage. The newest structural platform beam designs will span greater distances and carry higher load bearing capacity than typically prefabricated work platforms can offer. Raised industrial platforms and mezzanines can be custom designed to any form, shape or size needed for your particular use. With a structural mezzanine, the clear overall height above the lower floor is not a problem because the finished height can be custom designed. There are many options available for moving your product on and off the mezzanine quickly and safely including lifts and conveyor systems as well as the stairway, landing and handrail options. Mezzanines can also be an option for moving your less accessed stock off the main floor without moving it out of the work vicinity. They can also be used to bring another production element in close proximity of the assembly process without taking away any of the main production floor space. Mezzanines can provide new locations for offices, training rooms, manager monitoring areas, quality control, pallet and stock storage and other vital areas without interfering with the main floor. This would also provide environmental and noise separation from the main floor. KABTech provides several solutions for adding needed office space in your facility to increase production and efficiently. One of the difficult tasks of any warehouse operation is to put the management personnel close to the working process and still allow them to have a quiet, well-structured work area that will be separated from the distractions of the work floor. KABTech’s in plant office structures allow offices to be added to any facility quickly or dissembled and moved to keep up with your changing industry. This is the easiest way to keep modification costs down as you adjust for expanding productivity. These office structures make it possible to put your office personnel near production activity without compromising an efficient office atmosphere. KABTech’s modular in-plant offices can be erected over existing offices, built to fit any wall configuration or shipped as a pre-constructed unit for fast installation. They can even be constructed in a two-story structure to save even more main floor space. Many in plant office options are available to create modular cleanroom units that accommodate your choice of options, CMM rooms, break rooms, glass panel observation rooms and rooms that require special air filtration and temperature control. The possibilities are endless. These components can be dissembled and relocated as your need change. All components are prefabricated, so production disruptions and mess are minimal. A variety of wall, door and window options that require less maintenance than conventional construction methods. Many popular wall and panel colors to select from. Segmentation or defined product space is another way to improve your warehouse production. Improving efficiency and quality of operations in limited warehouse space is to divide correctly different warehouse operations that are in the same vicinity with the right dividing wall system. Warehouse or product production activity can be a fast paced and nonstop. Safety and protection of product and personnel are a number one concern. Processes that are done in close proximity can be safely separated by the use of a divider wall system such as an economical demising wall. 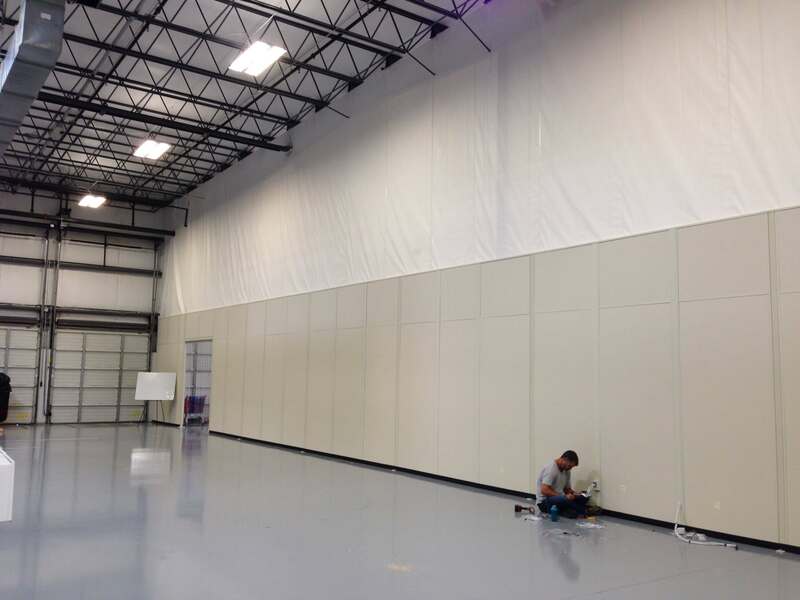 This dividing wall system saves usable workspace by allowing different processes that require particular attention to air quality, dust, noise, and temperature control to share the same building without sharing the same dust and contamination. Dividing product storage from welding or powder coating processes for example, will keep your employees and product safe without additional costs of constructing additional buildings for that purpose. These modular wall systems can be dissembled and moved as your facility expands without the material waste and high cost of conventional divider wall construction. Your warehouse or industrial facility should be considered a production element and not just a building to house your product storage or production elements. Design it to be productive and efficient with all its available space. Everything should be in its correct location and easily accessible. Your warehouse storage ideas and goals should not be limited by an outdated racking system. Don’t let your employees be hindered by inefficient storage rack systems, forklift traffic problems, noisy machinery, dust, and fumes or unnecessary clutter. You can’t afford to have a poorly designed shipping and receiving department lacking in needed office space. Planning the use of available floor space, storage rack space and how that space is used will ensure efficiency and keep the overhead costs down with maximum production. Improper pallet storage can be one of the greatest space robbers of product storage space in your facility. With product coming and going, constantly being sorted and rerouted, it is no wonder that this area can be found with large gaps of floor space and cluttered or with pallets that don’t nest well in racks as designed. Before you set up a pallet racking system, review your product, the paths it will take and the equipment needed to move it safely. In most warehouse storage situations, your target goal should be utilizing 88% of your available storage rack space. Trying to gain more pallet storage than this will require more aisles, thus lost storage space. A lower percentage of used rack space will produce honeycombing or racking half empty pallets. The result will be storage racks that are full but are storing only half the product efficiently. KABTeck offers many solutions to your pallet racking needs including drive-in pallet racking systems. This drive in racking systems can be custom configured to fit your requirements. KABTech also provides several different styles and grades of pallet rack shelving systems. They offer industrial structural pallet racking systems and versatile teardrop racks that are bolt-less for easy and fast installation along with cantilever racks and many other rack designs. In our final thought we want to emphasize that quality product storage space, office management space and product production floor space is all crucial to improving your warehouse organization, productivity and safety. You do not have to compromise on one area for another to improve productivity because you do not have the necessary budget or space in your facility. You can turn the wasted space in your facility into new profit making space to increase your efficiency and productivity in all areas. KABTech has many solutions and warehouse storage ideas to expand your usable space to increase quality and productivity quickly and affordably with minimal disruption or downtime. Many of our clients have us install large, crossover stairs and raised walkways to safely bypass large machinery or conveyor lines. You can contact KABTech corp today and discuss any warehouse space or office space problems you need solutions for. Help is just a click away. Also check out the other product available from KABTech to make your industrial plants more safe and efficient like security buildings and parking lot prefabricated guard shacks, wire security cages and screen dividers as well as many other products for your industrial modification and up fit needs.